Healthcare facilities and medical research organizations should put in place a medical ethics compliance program to ensure that their staff and the organization as a whole are adhering to the industry standard norms of medical ethics principles. These training and compliance programs help ensure that staff are informed about the medical ethics delimmas they will face daily and how to address them properly. Adhering to industry accepted medical ethical standards and guidelines will result in successful patient interaction, improved outcomes, proper legal compliance, minimized financial losses, and reduction of any potential disputes or litigation. Our Organizational Training is for an organization looking to train its employees on medical ethics and obtain their medical ethics certification for them for compliance and liability record keeping. To setup an organizational training account, simply enter the number of training seats you need in the QTY OF SEATS field in the Online Medical Ethics Course section below, and then click on the ADD TO CART button and then CHECKOUT to complete your registration. Our online training course is meant to provide a solid understanding of the field of medical ethics as well as satisfy the training requirement for medical ethics training. 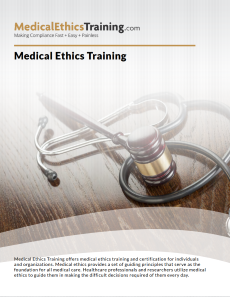 A wide range of medical ethics topics are discussed in this training such as patient confidentiality, informed consent, surrogate decision making, disclosing medical errors, medical research, beginning and end-of-life issues, etc. 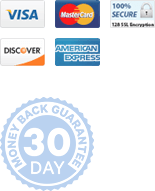 Case studies are also provided to apply principles learned to real world situations. 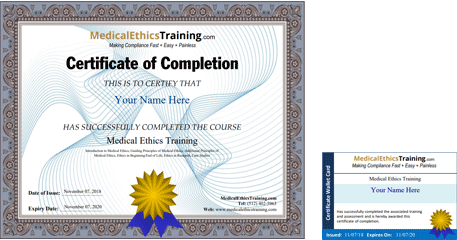 For an individuals, they just need the Medical Ethics training which is $29.99 for a 2 year certificate. Yes we do. That is our organizational training. Choose the Medical Ethics for Organizations item from the top products menu and go the Employee Training section. Yes we do. Choose the Medical Ethics for Organizations item from the top products menu and go the Employee Training section.